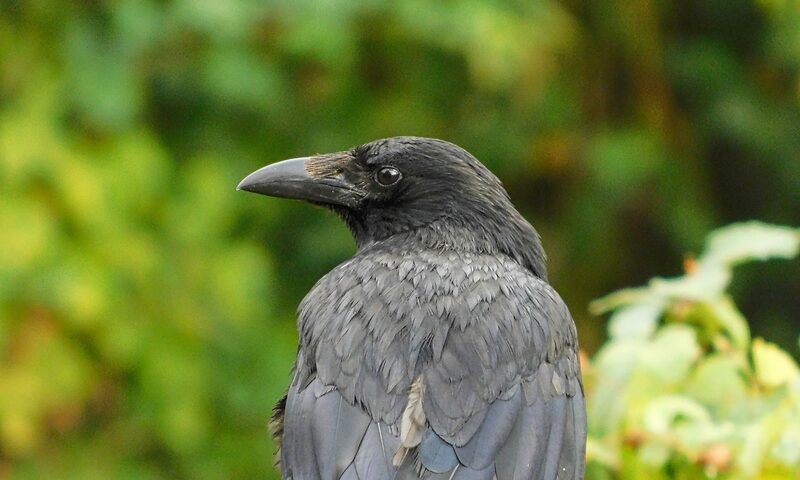 Two common questions we are being asked every year are how and when to release carrion crows, rooks and jackdaws. The answers to these questions consists of two main parts. The first part is based on generally accepted non species specific rehabilitation guidelines, and the second part is referring to species specific considerations. 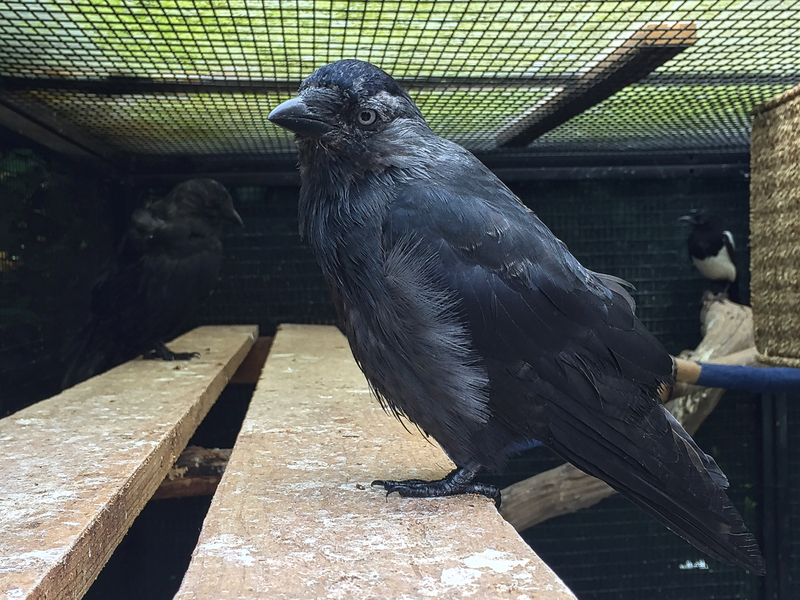 Kojak, a nestling jackdaw, has been brought to us after being found on the ground, for reasons unknown to us. 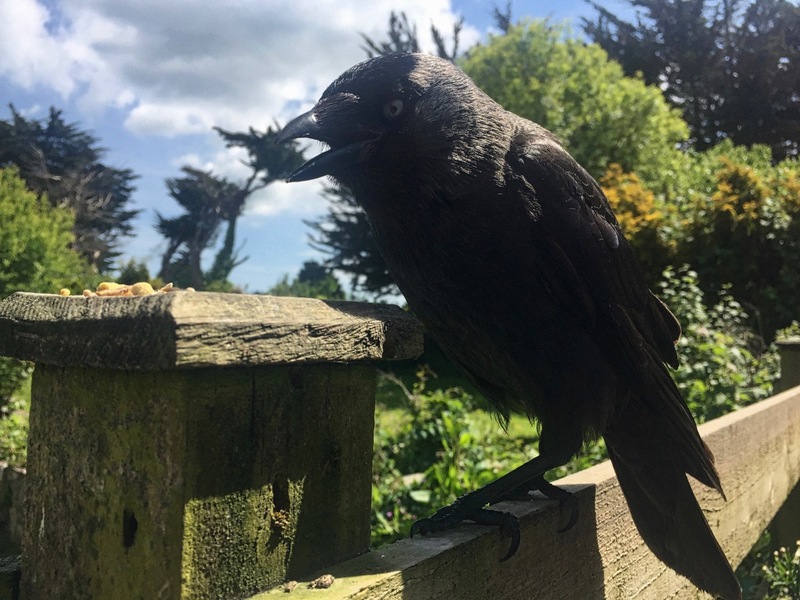 He might have been the runt of the brood, thrown out of the nest by his own kind, but he was lucky enough to have been found and rescued by a very kind and compassionate person. However, we have also learned over the past weeks, where we had the privilege to care for him and to get to know each other, that being the runt doesn’t mean at all that the bird concerned doesn’t want to live. Kojak has got the spirit of a fighter, whilst also being a very gentle and loyal soul. He came to us almost dead with signs of severe dehydration, starvation, and malnutrition with poor plumage development and splay legs. Kojak’s leg muscles where severely atrophic, which made it impossible for him to stand up properly, to walk or to keep his balance. Due to a severe electrolyte imbalance caused by dehydration and starvation, he developed seizures and other neurological symptoms. After days of intensive treatment, sleepless nights and a life-threatening relapse, we eventually managed to stabilise his condition, which was the crucial moment when things started to improve. But not without Kojak’s help and strong will. We would not have been able to save his life without his own determination and help. 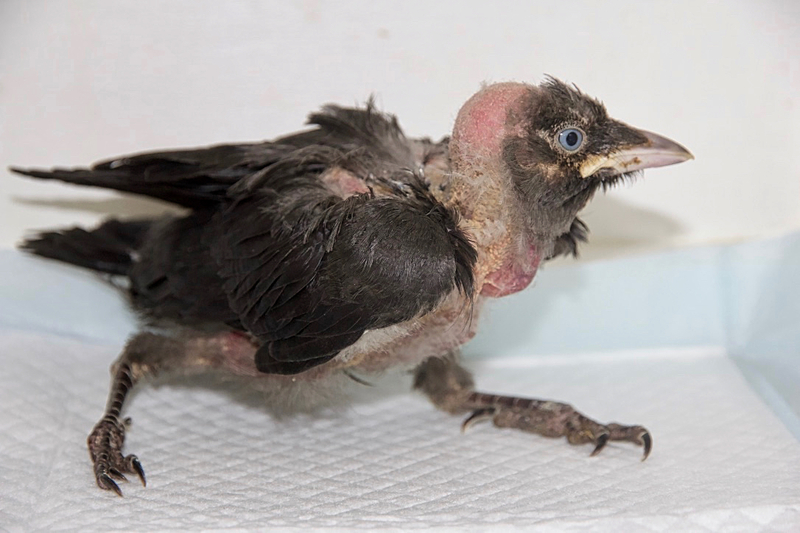 Kojak was determined to get stronger, to walk and to fly. Thanks to his healthy appetite, and a specially designed diet, he started to put on weight and to become stronger allowing him to exercise. And that is what he did. He was exercising and practising all day long until he was strong enough to stand up and to walk. He exercised his flight muscles until he was able to lift off. But he didn’t do all this alone. 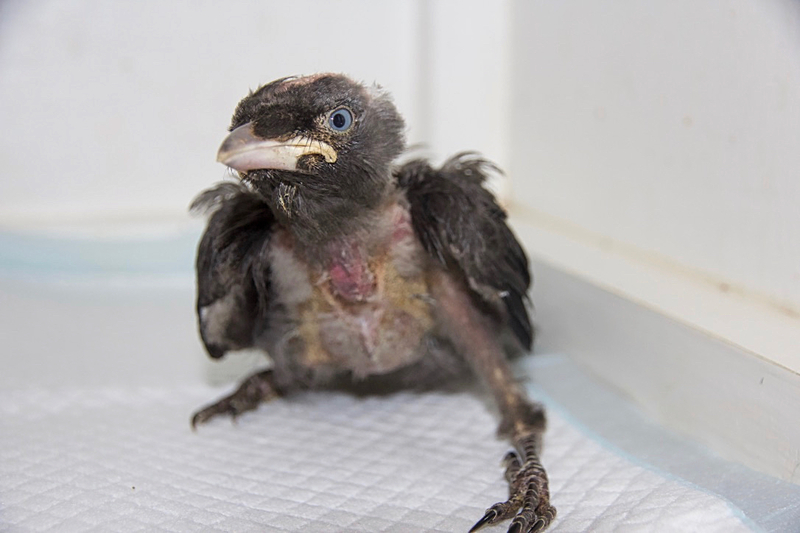 He was inspired and helped by another patient, a jay nestling we named Alita, who came to us as a very poorly orphan as well, and was of roughly the same age as Kojak. 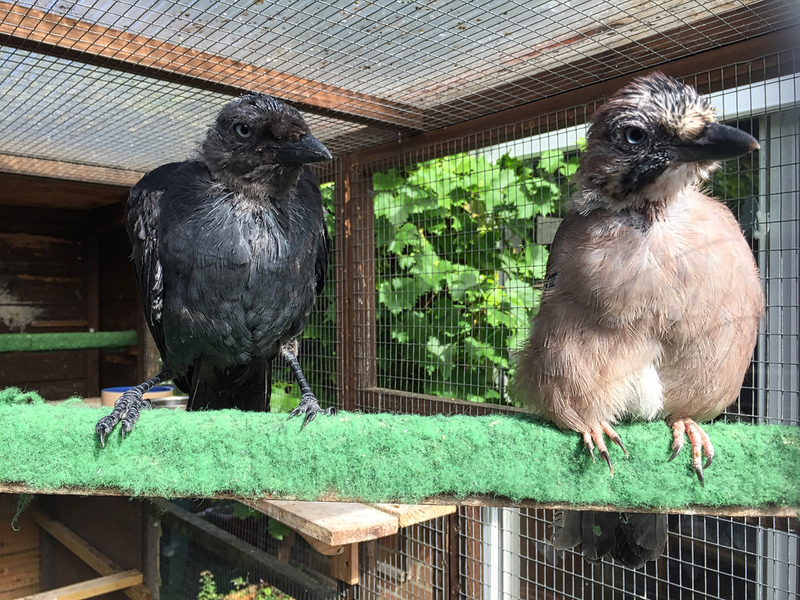 Both birds got on very well and soon ventured out together to explore their outdoor rehabilitation and recuperation aviary, encouraging each other to take on the next hurdle. Then the time came for Alita to say good-bye, to get her second chance in life and to be soft released. It took Alita a while to make up her mind, but eventually she left. She still visits the area and occasionally her old friend. Both birds seemingly knew that from now on they have to look forward, into their very own futures, after having spent a short but important period of time together, a period of time which helped both birds to find their place in their respective worlds. 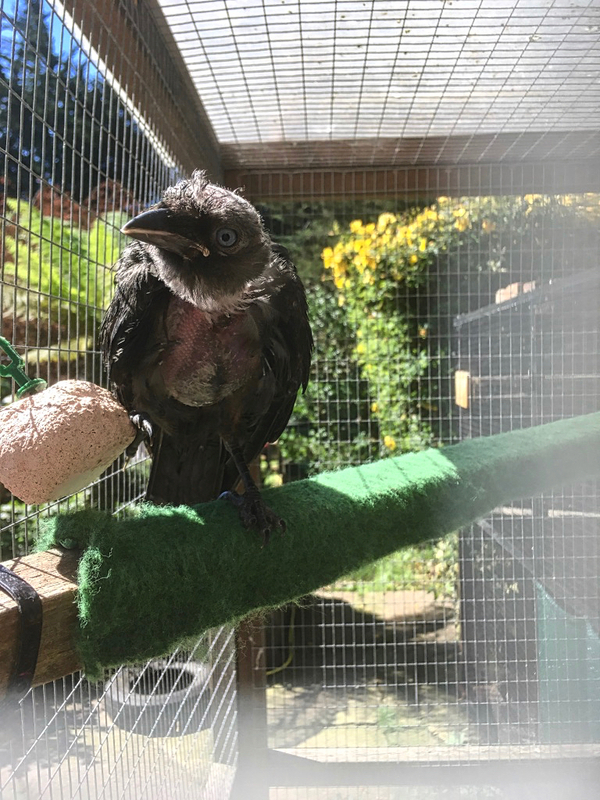 By accident, at almost the same time a new patient came to us, a juvenile jackdaw we named Benno, who suffered a badly fractured wing. And within a few days, both birds bonded, almost as they would have waited for each other. Kojak’s journey hasn’t come to an end yet, as he still has got some smaller issues to overcome. But since we know him now that well, we are confident that these issues should not be a problem for him, in particular not with the help of his partner Benno. All it needs is time, trust, love and determination.